Subject: Rules I think that needs to be or mabye needs to be changed. First off I want to say that I absolutly love this game and I think it is definently one I cannot stop playing (I have 70+ games under my belt). However after discussing rules with Sean here on the Geek I feel that most confusion has cleared up but some things feel wrong. No that they cant be fixed or that I am neccesary right but for me the following things I would like other to comment on, including Sean. 1) This one is the most important. Line formation and column formation. 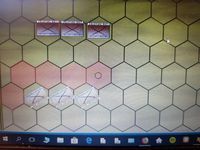 Being a hex based game that has armies facing in scenarios both from short sides and long sides creats a very wierd and unrealistc movement and fire when formations have different facing (hex spine vs hex side) If I was able there will be pictures at the end of this that shows more of what I mean. I will try to explain. 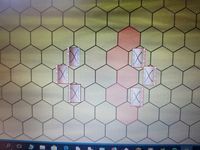 When units are in line formation facing eacother on each long side they can move Stright (to hexes in front of the unit) and to one side (the side it is facing). This is very wierd since they representing a straight line and a straight line should have it as easy to move left as to move right. When units are facing eachother on the short side they can move forward and diagnolly forward in both directions. This means that a unit behaves completly different depending on its oriantation to other units on the map. 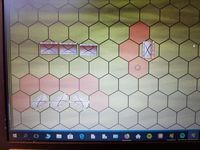 So a flanking unit have different move options than the none flanking unit if a battle is fought on the long sides. This is ofcourse true for units in column as well. Units facing each other on the short side in column can move straight forward and to one side (depending on which hex spine it is facing but not the other). 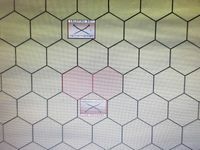 The same goes fore fire and close combat, one side can get a protected flank but not the other which should not be the case for a unit in a stright line. The fix to this is. Not having units change their facing (Spine or side) to represent its formation. 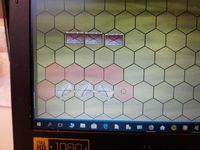 Simply placing a marker or other to show it is in line and have all units only facing hex spines. Yes this makes line formation a bit weaker since it loses one front hex but line formation is already so supperior to column which it should be for infantry.And still not so beneficial to horsemen which is also right for the era. With die roll modyfiers an infantry unit marching in column will be shot to peices. And a unit changing to column in face of the enemy to close combat and get that +1 modifier is extremly dangerous it will morst likly be shot to peices during the other players turn or during defensive fire. 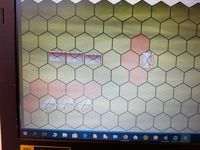 Column and Line formation for horsemen and infantry is already very well represented without the extra odd hex that a line is given at the moment. I dont think the designer needs to rewirite this but add what I have writen as an option. When Im promoting the game at the club this is the only thing that bugs people do discard the system which is a shame because it is otherwise a fantastic system. Any thoughts? 2) This one I am not sure about any more and I think the rules should be as they are but wanted to discuss it anyway. When you use the optional rule Fire at Range 1 hills does not become a benefit for the one on the hill since both units will have a - 1 DRM if a unit is attacking a unit on a hill and both units wil lalways fire. This have been discussed under the topic "Rule Clarifications/Corrections and Suggestions for the "Living Rules" at this forum. Seans response is that bothe units are so close in the attacked hex that they both are penelized (or something like that) but for hills someone needs to be uphill right and have a benefit. However I feel that for fire combat it might not matter on which level you are on in real life? And the same goes for cavalry counter attacks on unit must be charging down hill with a benefit right? I might be wrong here as well. Cavalry in ancient times did not benifit that much but in this period i thought they would. Any way this is so minor and may make the game to OP to be in a defensive position (Other than trenches and forts). I might even be wrong in my knowladge of this era that I do not think it needs to be changed and complicate the game more. Any Thoughts? 3) A minor one which I think is a miss print or two the first one states that under Jacobites nationality rule charismathic leader they get a +2 MR, I think it should be +2MP surely they cannot move 3 hexes right? The other one has been cleard up by Sean and that is that Cannons cannot defensivie fire against charging cav which I think is correct but the latest rule book tells otherwise. This need to be clearified in the rules. Other than number 1) this games is truley fantatic. Now lets see if I can add those pics or if I fail. I failed It takes forever for some reason. I wil ltry at a later stage if some does not get what I mean? I made it=). These are the picture to show what I mean by odd movement and fire for units representing stright line and columns. Oh 1 more. This one need more of a clarification "Infantry with Pikes" special rule states that if infantry with this special rule is attacked in the flank the attacker does not get the extra die. I guess this sympolizes the units abillity to protect its flanks with their long pikes. But what about when units are attacking the flanks of a pike unit from a distance? Lets say a cannon shooting from 3 hexes away or an infantry shooting from 2 hexes away? The pikes are not that long right;)? or am I missing something? 1) Matchlock should only affect fire combat right? It is not stated that way? 2) Pike infantry - 1DRM should also only affect fire right not closecombat? 3) Matchlock rule states it effects infantry. Should it not also include light footmen? 4) If you play without the "locked in combat" optional rule and play with the flanking rulse horsemen adjecent and facing the front of an enemy infantry unit can simply move around it and change facing so that on the next turn the infantry unit cannot move around to attack it (may only pivot 1 hex) Even though I house rules units ability to "about face" for Two CAP your opponent can still do this just to drain your CAP. Also units can go around in circles chasing each other like this without any combat able to take place. If you however play with the "locked in combat" rules another issue arise. If for an example a dragoon kills a unit at the end of a line of infantry men the dragoon would end up adjecent to the next unit in the line but not able to face it because it is not allowed when you advance by the rules. It would be crazy to try to roll for moral to change its facing so that it faces the new threath next turn since it is much more likly to fail and lose a MP (Dragoons only having 2 MP). It also created a lot of situations where week units just got strangly locked and sat their with their backs facing eachother for the entire battle. My suggestion is to keep the optional rule as it is except when it comes to facing. A unit should be able to change facing without a moral check, otherwise a lot of strange situations will arise. Any thoughts? The rules for both of these state "at R1-2", that is, the rules as written do explicitly state that it's only affecting ranged/fire combat and not close combat. I think you might be right on this point. I plan to do some revisions after a few tests of some battles. Stay tuned for updates next week. It is +2 MR. This represents the Jacobite rush to battle. That said, I was very close to dropping this rule so if you don't want to use it feel free. They already do not shoot as well and found it made them useless. Should keep in mind such units rarely appear in pre-1700 battles. Militia though was an exception since they are massed infantry that lack training/experience. Feel free to house rule this as you see fit. I can see units changing facing of course. However, I also think it makes you wary of tossing in your Horsemen into a double line of infantry. So maybe they can change facing but must pass a morale check, but without taking a hit. Maybe give a bonus to Dragoon and Hussar considering they are light formations. As to Horsemen chewing up flanks, try to preserve your horsemen to avoid this fate. Cool! I will wait and see what happens to the hill rules:). Jacobites get 3 MR then 1+2 MR? Matchlocks make sence. Thanks för the clear up. When it comes to facing in locked combat your original rule might be right. As your saying it makes you play in a way which represent the era quite well. I Think I was wrong on this one and had to much of other systems in my head. Your way might actually be way better suited than house fuling since horsemen was much less supperior in this eara and used much more for for clean ups. 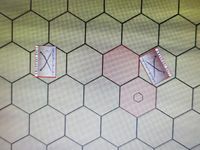 Infantry with reduced moral might also be shaken after winning and advancing after close combat and ending up between enemy units or to the side of one. I Will play a bit more with your rules before trying to fix something that might not be broken;). I skip giving hussars and dragoons better moral and ignoring hits since your rules seems to be much more based on moral rather than mobillity? I also await your feed back in my concerns reagarding formation facing. However I might be wrong on this one as well. I play this game litterally Every day and felt that the weird facing and front arcs makes movement and fire etc very weird as stated in my above post and example. But perhspes this abstraction is needed to make lines so much more upperior to column. I Will play with your rules some more and see how it seems but please feel free to give your perspective on it, I know you have before but just briefly;).